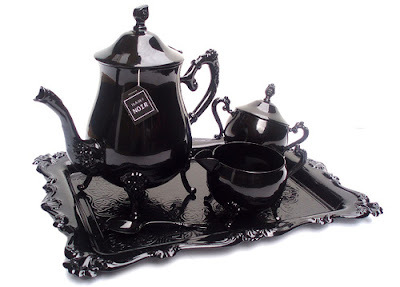 Ok, so I found a tea set that just might outshine the previous one I found and love. I don't know what it is about black and ornate but I can't seem to pull myself away from it. One major problem however? I can't seem to find out where this set is from. Sadness. *Update: Thanks to Jessica I know have a link and might be able to get the tea set of my dreams. Check out all of Christine Misiak's other gorgeous tea sets while you are at it. Thanks again Jessica! Merrilee...this is Jessica, Cambria's cousin. I think we met once a really long time ago...Anyway, I check your blog every once in awhile (so fun, by the way) and saw the beautiful black tea set. I'm pretty sure it's a Christine Misiak design...she works to order. I hope that helps and that you can finally get the tea set of your dreams! Thanks so much Jessica! (and thanks for checking out my blog). LOVE the coach bag you are craving on your blog btw. cheers :). That tea set takes the cake! It has to be the prettiest tea set I have ever seen! hi there, this is Christine Misiak here. Yes that is one of my tea sets. Its actually recycled from an old set. Thanks Christine for the info. I love all of your tea sets! Thanks for stopping by.